I am a Jill of all trades and the only thing that is stopping me from becoming a master of them all is the golden excuse: Time. I normally am a very hyper person who just cannot sit quiet and has to do something all the time. When my husband is around that something is mostly talking. Both of us are great conversationalists and we end up sitting and talking non-stop most of the time. But since he moved to a new job a few months back, I'm home alone for a couple of hours every evening once I return from work. This is the time when I'm at my busiest. Even as a child, I loved to be left alone at home every now and then. I absolutely cherish the lone time that I get for myself and it can only happen when I'm home alone. If there is someone at home then I inevitably end up talking to them. When I was young I would finish school/college and come back home by early evening. Both my parents and my sister were working so I had the entire house for myself. It was such a fun time. I used to freshen up and make myself something to eat. The I used to sit and read endlessly. Most of the reading in my life was during this time. I'd just make a cup of coffee for myself and sit with a book uninterrupted. Rarely, I used to watch TV and at times I just used to put on some random music and dance endlessly. Ah, those years of being tension free! When I started working and spent the first five months in Chennai, I used to come back to an empty hostel. Although I did miss my family back home, I loved the peace that I came back to everyday. After a tiring day at work, I just used to snuggle up with a book and read until I fell asleep. Once I moved back to the city, being home alone was a rarity. By the time I got back from work, my parents would be back too. I hardly found any time to be alone and do any thing that I wanted to. Being home alone makes me feel at peace. It's almost like a blank canvas has been handed to me and I could do anything with it. I do enjoy solitude, but not for long. I love being home alone for a couple of hours and it makes me very happy. But only for a while. After a point I'll start missing people and would want to talk to them. Having said that, not being able to be home alone for a while makes me miss my "me" time and all that I have in my mind to do. Now that Cal takes time to get back home, I have some good alone time with me. My first priority has always been reading when I'm blessed with some free time. I make a cup of hot green tea and sit with my book for a couple of hours. Once the clock strikes 8, I head to the kitchen to prepare dinner. Normally by the time I'm done with dinner, he's back and we sit and spend some time together. If he's not, then I get back to my reading. At times, I sit and draw instead of reading, or just browse the channels on TV, or listen to music and clean, or retrospect, or I write. As much as possible I try not to use the laptop once I'm back from work. 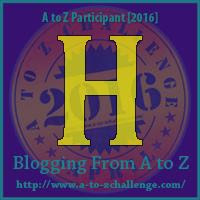 But thanks to A to Z, most of my home alone time is spent by writing and reading other blogs. No, I'm not complaining. In fact I'm absolutely loving it! Being home alone at times is absolutely necessary for me just as much as being with some delightful company. It is like a detox that keeps me going strong. But then again, a detox diet is not for everyone and is not something that should last long. Or forever. I love being at home alone and as you said not for a long time. "Me" time is certainly essential for everyone.It makes me clear the clutter in my mind and get clarity over things. I guess everyone of us needs the "Me" time. I would say every person is so productive and he/she could utilise this time to do things he/she likes. I just realised this recently and have been spending time doing this..
As a kid, I spent my time after school reading or writing some notes or anything. May be that is how I deeloped a liking for writing. Oh, I love my Me time too. That's another story that sometimes I have lots of it and I cherish it the most. Reading books and blogging takes up most of my time. The day when this Me time is delayed or does not happen I get that restless feeling. Oh, I love the alone time. Unlike you, I am more of a solitude lover and I like to spent time alone and rarely talk for hours with my friends. I read, I write and watch movies during my free time. Nothing as wonderful as being Home Alone when you have a busy life. That time to read and reflect, and in my case, to write, was so precious. Now that I'm an empty nester who is divorced I have plenty of Home Alone time and look forward to time with friends, or when the girls drop in. It's all about perspective, isn't it? Me getting time alone at home is like bliss. I prefer writing when no one is at home. I have this weird habit of writing: I don't want people around, and certainly not staring at the computer screen while I type. They can read it after I hit publish, but not before! And I agree with that point: when you're home alone, you enjoy it for some time, but then crave human company! Classic introvert - join the club! Quiet time reading is one of my favorite activities also. It's how we re-charge. Alone time is so important. But even for someone like me who doesn't have kids and whose partner travels a lot for work, I still feel like there isn't enough time to learn and do everything I want to! That's the good news - there's always more to learn. My wife works during the day and I'm retired so I have a lot of home alone time. That works for me just fine.